Gold: a commodity which people from all the world invest in. So what is gold? 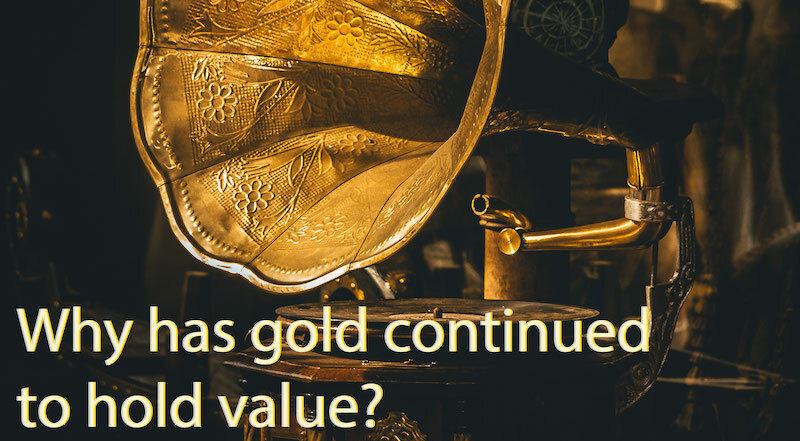 Why does gold have value, and how is it determined? Most importantly, how can you make a sensible, informed investment for yourself? You may be asking yourself, how many ways can I invest in gold, and which is right for me? All great questions, and in the following article we will answer these and more, in 13 ways to invest in gold. Gold has an incredible and rich history, spanning thousands of years, all the way back to early ancient Egyptian civilisation. However, way back then, there was a time before measured value, and gold itself was desired for its practical and decorative properties alone. Yet, as early as 3100 BC, gold can be found measured favourably against silver. In the code of Menes, one part gold is equal to two and half parts silver. Many gold artifacts were found to contain some silver, so it is worth noting that although held with prestige, the refining process was not actively pursued for some time, and more typical bartering materials were grain, papyrus, oil and other pre-coinage resources. Gold is a chemical element, and a radiant and precious metal. It has an atomic number of seventy nine, and a melting point of one thousand and sixty three degrees celsius. Yet, what makes gold so special, beyond its structure? Well, it is bright and attractive in colour, incredibly durable (almost impossible to destroy) yet highly malleable. Also, in its naturally occurring state, gold is commendable in its purity. Beyond this, due to its adaption, and history of perceived value, gold has a reputation like no other. Even when other precious metals such as rhodium and platinum are worth more by the gram. Why Has Gold Continued To Hold Value? Looking back to when gold was the choice, over and above other metals, for coinage in the shift away from the bartering system, we can see why it was chosen. Gold does not corrode, unlike iron or copper. It has an appropriate weight, unlike aluminium, which is too light to feel valuable. It is also rare, but not too rare, as is the problem with platinum or palladium. As time has passed, gold has inherited its very own history, and much of its value today is perceived value - coupled with the fall-back mentality which places gold as a post-fiat insurance against economic disaster, whether personal or on a much bigger scale. After all, gold was the primary form of money up until the early 20th century. Some rare gold coins have even sold at auction for millions of dollars. Talk about inflation! How Can I Invest In Gold Today? There are many ways to invest in gold today. The real question is, which is the best investment method for you? 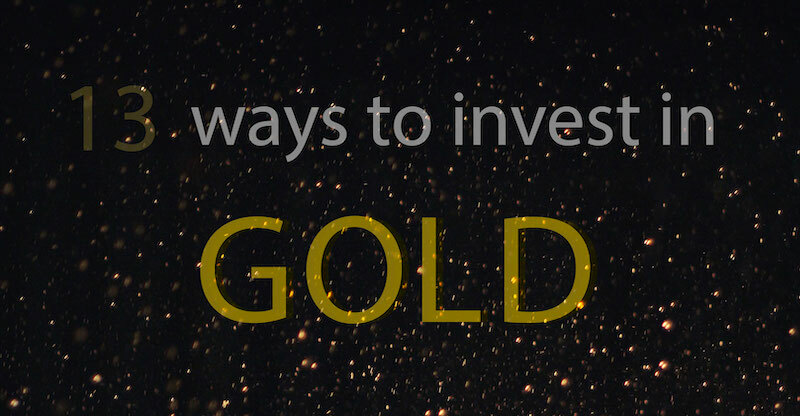 Here we present 13 ways you can invest in gold. Ah, the purist. Buying gold and keeping it in your possession may be the only way to invest in gold, if the precious metal itself holds a special place in your heart. In this case, the best way to take ownership of your very own hoard would be with coins, bullions or bars. This is a great choice for the gold purist because you will profit from the satisfaction of storing your own gold, something which you may find priceless based on some of the properties which have made gold such a popular precious metal - the illustrious colour, shine and purposeful weight. However, the satisfaction of owning your own bar of gold will come at a price - namely commision upon purchase, considering most purchases of this nature will be conducted through a reputable dealer. It should also be noted that upon sale, you can expect to receive below spot price, especially if you are looking for a quick transaction. There are other things to think about beyond asset value, a big one being security. You might be considering having your gold on display, or stored somewhere you determine as safe. However, it is always worth imagining worst case scenarios and being ready - think secure safe, insurance and 3rd party storage. Safety conscious, unperturbed by the inability to show off your gold at home, and still set on owning the real deal? You may find that outright ownership of physical gold, stored with a secure third party, is the investment option for you. Depending on how this is done, you may or may not ever see the gold you own. 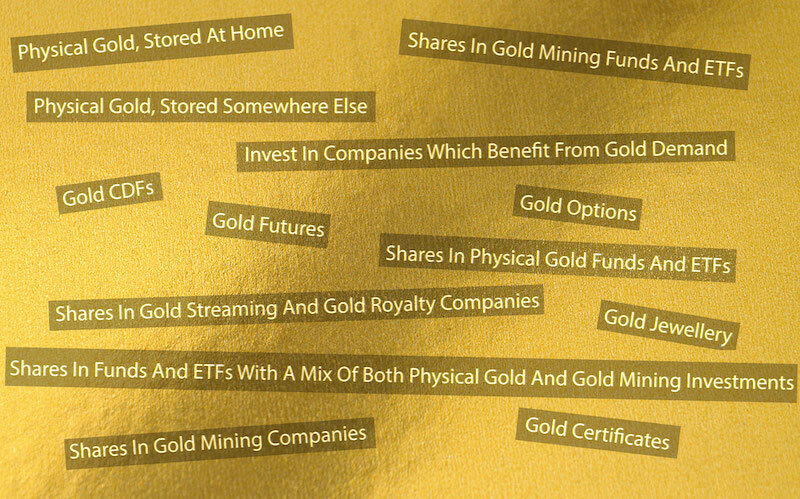 There are services which allow you to purchase gold and have this stored, outside of the banking system, and visit upon appointment, and you also benefit from the ability to buy and sell at spot prices, albeit commissions still apply, not to mention the ongoing storage costs which will ultimately reduce any returns on your investment over time. Gold futures are pretty far removed from the previous two options, and you may not be taking ownership of any physical gold whilst dealing in this way, as many futures are settled with cash. 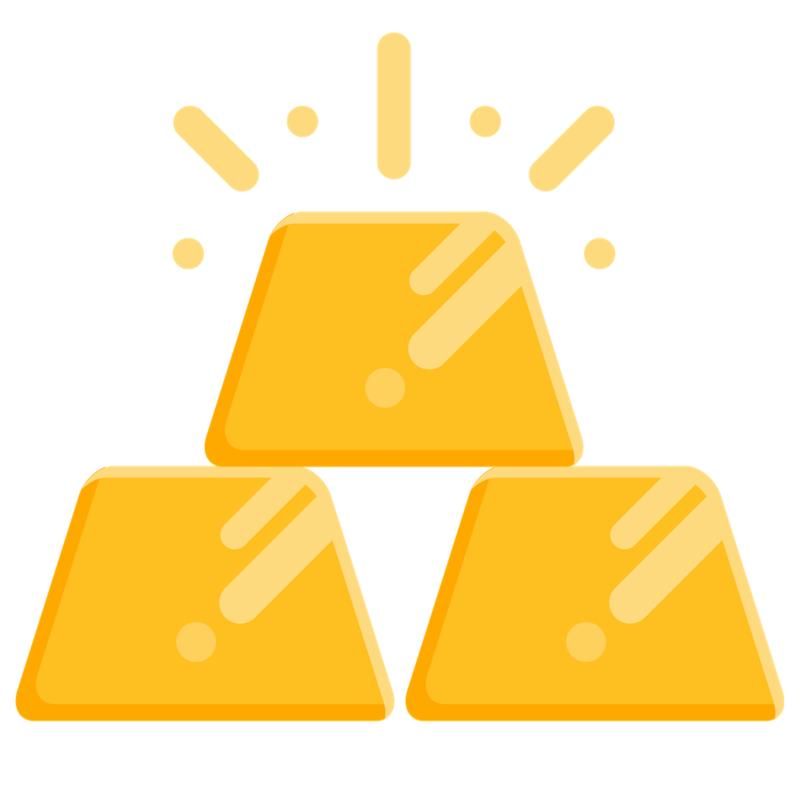 However, the ability to receive gold purchased on the market is real. In order to get started with gold futures, you will typically need to find a broker who deals within this market. Put simply, a purchase of gold via gold futures is the agreement to trade now with a determined fixed asset value, but with a settlement date set in the future. Considering this is a fairly advanced form of investment, it is worth knowing the ins and outs of futures trading before deciding to invest in gold this way. It is important to note how gold futures are used and who uses them. Consumers and producers of gold can negate price risks by using futures, which allow them to take today’s price and carry this forward, which will protect them against price fluctuations which may hurt them. Consumers will be hedging against the price of gold going up (a long hedge), and producers will be hedging against the price falling (a short hedge). Speculators, or others interested in the investment of gold, hoping to use gold futures to amplify a return on their investment, will be looking to exploit these price fluctuations for personal gain. Profits and losses can be many times greater than the initial outlay, so for this reason investing in gold futures is certainly high risk and high reward. Gold CDFs are similar to futures in the initial fixed agreement upon taking position, however you will not be taking ownership of any physical gold because CDFs by very definition (contract for difference) are a trade based on profits and losses being determined by the movement of value from the time the position is opened. There are many benefits to gold CDFs when compared against gold futures - the barrier for entry is much lower, activity is higher and there is no future date of settlement, so profits and losses can be taken at any time. However, a broker is essential for buying or selling CDFs and due to the non-standardisation of fees or commissions, it can be confusing finding the right broker for you, and getting the best deal to start trading. Again, due to daily fluctuations, movements can be large and hard to predict, so just like buying gold futures, gold CDFs are also high risk and high reward. Buying gold options is a great way to trade gold, if being able to determine risk is important to you, as options that end ‘out of the money’ ie. at a loss, will only cost you the premium you have paid to command the right to purchase gold at a set price at expiry. To understand more clearly, an example would be paying the call price of $1 on an option, with gold price currently at $1292/ounce. Each options contract shows an interest in 100 ounces, so the option premium price will total $100. If, at expiry, gold strike price is up to $1298, this trade will be ‘in the money’ and a the profit per ounce of $6 will become a net profit of (100 x $6) - $100 = $500. If the closing price upon expiry is too low to yield a profit, a loss will be taken, however a maximum loss is set to the total premium paid for the option, which is $100. So, depending on possible movement of the strike price of gold, it is possible to make exponential profits with options, whereas the losses are at least limited. There is also the option to ‘put’ instead of ‘call’ which would instead give the right to sell instead of buy, allowing for profits to be yielded from falling prices, too. Firstly, it must be said that going back to the physical ownership of gold has priceless benefits that really suit the purists out there who appreciate gold for what it really is. It is also worth stating that pure gold, of 24 karat fame, is actually quite soft and therefore not so great for wearing as jewellery. So, when it comes to gold jewellery as an investment, a higher karat will be more desirable, but at the cost of practicality. On the other hand, collector’s items and special pieces, desirable due to other factors beyond purity of metal, can be a great choice albeit for slightly different reasons. In some ways far removed from physically owning gold, buying shares in gold mining companies might be considered a more abstract choice, especially if you are interested in investing in gold because you like owning physical assets. Yet a purchase of one ounce of gold will remain that same ounce of gold forever more (whether that is a good or bad thing is entirely up to you). On the other hand, here we have a growing, evolving stock which goes beyond the ups and downs of strike prices and the simple supply vs demand. If you enjoy the complexities of business, growth and would like to see more personality from your gold investment then this may be a really good idea. Of course, there is risk, as not all businesses achieve growth and that's a fact. However, on the chance that a good choice of investment, in a mining company which does increase production, you could see growth which is unlikely to be found in physical ownership of gold, be that bullion, coins, bars or jewellery. Buying shares in a gold streaming and royalty company comes highly recommended, due to the pros of having a fairly direct exposure to gold investment, although you don’t receive any directly, but without some of the risks involved should you be investing in a gold mining company. Gold shares and royalty companies act like a finance body, providing funds to mining operators in exchange for future purchase agreements at reduced rates - in some ways similar to interest rates, where the interest is instead represented as discounted acquisition of gold. Added to this, many of the larger streaming companies do pay dividends to their investors due to the wide margins of profitability. It must be pointed out that although there is a touch of gold, most streaming companies diversify their commodities, so you would do well to investigate if you wish to know exactly what else you might be involved with, silver being a good example. Accessibility is key, and the good news is: you can join a fund with the simple purchase of just one share. There’s a best of both worlds perspective here, as you are technically buying physical gold and storing it with a third party, however, you are part of a bigger fund which will likely accrue a tidy return on your investment whilst doing all the hard work. Expense ratio is the term used to describe the recurring costs involved in participating with the fund. When offset against the annualised returns, it is a small price to pay, especially when stacked up against some of the costs involved in the purchase, insurance and storage of physical gold as a solo investor. It is worth noting that comparing trust funds against ETFs is worthwhile, and know that trading in ETFs is more freely executable as these can be bought and sold at any time during trading hours, whereas trust funds allow this only at the end of the day’s trading. As a long term investment, dependable and steady yields can be expected and the risk factor is very low indeed. Again, bringing ETF benefits, of being involved in many different investments within a single fund, this is another choice which allows for diversification with minimal effort from the standpoint of a solo investor. There are quite a few factors that should go in to your decision, should you chose to invest with a gold mining fund or ETF, such as geographical locations and operator sizes. You may find that the objectives or particulars of one fund will pique your interest over another, and this is another factor to consider on top of annualised returns and expense ratios. It is also important to know that these funds do not always move in line with the price of gold, and could be subject to other factors, such as mining incidents and activity detached from the price of gold itself. Generally, gold mining funds should be assessed based on their investments and objectives, as there is an element of risk and reward here. Can’t decide if you prefer the predictability of fund movement with the price of gold, or the excitement and potential growth involved with more hands on, real world investments? Well, you can have both. You may be interested in a fund so diverse, it touches all sides of the gold spectrum, from physical hoards of bullion to start-up mining operations. This is where things get really personal, yet with just one single share purchased, you could technically have an incredibly diverse investment in gold for very little money indeed. Perhaps the most removed from hands on gold ownership, choosing to put money in to companies which prosper in line with the demand for gold, which we can all agree is perpetual: this is an interesting choice for someone looking to diversify their portfolio with gold in mind. This is a far reaching option for those creative amongst us who look for a different path, away from funds altogether, although the crossover is certainly apparent. Think bullion dealers, mining equipment manufacturers and other such organisations touched by the gold industry. These are mainstays who will no doubt survive both ups and downs in the market, however as always due diligence is advised. Our final way to invest in gold, and one which combines some of the benefits of buying gold coins or bullion but without the inconvenience of finding safe storage big enough for your stash. Gold certificates are similar to guaranteed cheques, however these correspond to unallocated gold and are a make-good, contractual agreement of sorts. In any sense, it is certainly easier to store a certificate, and one would assume this to be a lot less conspicuous than holding a gold bar or two, however such certificates are only as good as the issuing company, so best obtained only if you might take pleasure from such a symbol of gold ownership, and strictly from a well renowned source. So, What Is The Best Way To Invest In Gold? As we have presented, there are many ways to invest in gold, whether that be the real deal stored at home, somewhere safe or with a third party, or in some other form such as a future, share or option. There are also other forms of gold investment, be that jewellery or even a certificate. Gold can be considered a safe place to put your money, when other markets are suffering, yet gold can be volatile, too. There is also the question of timing, especially for those looking to invest in gold as a near-term investment, chasing quick profits. Ultimately, it is really down to how diverse you want your portfolio to be, and how immersed you wish to set yourself, in the world of gold and all that moves with it. © 2019 Howtoinvestin.com. All Rights Reserved.